The first Sake Festival Malaysia is happening this coming weekend and we were given a preview of some of the sake and food that will be available at the festival. Here are some pairings to give you an idea of how sake works with food (and the chef’s thought process). The three sakes below carry different taste profiles, body and finish from each other and were paired with some popular Japanese offerings. Junmai Daiginjo Blue has a polishing ratio of 45%, which means 55% of the rice grain has been polished away with only 45% remaining. Polishing ratio contributes to the flavours, aromas and body of the sake. This lighter body sake is fruity in taste with a floral nose and crisp finish. Goes well with food with lighter and cleaner flavours. a. 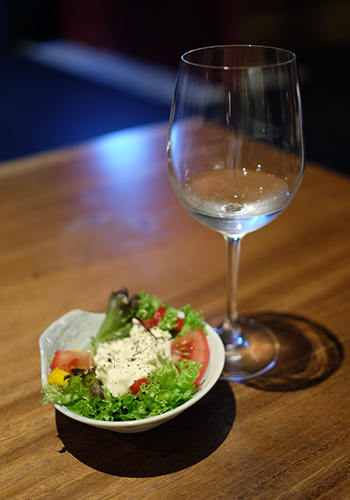 Salad – A salad with cream would go well with this sake as the clean taste enhance the sweetness with the same level of texture and body. b. 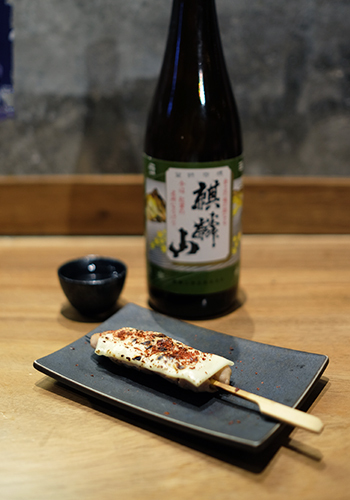 Chicken yakitori – The white meat and slightly salted Japanese snack makes the sweetness of this sake more prominent and lingers throughout the palate. A straightforward pairing. Junmai Ginjo has a polishing ratio of 55%, which gives this sake a medium light body compared to the Blue above. The fruitiness and floral notes of this sake are therefore less prominent than the previous one. However, it pairs well with food that is heavier and has more flavour. 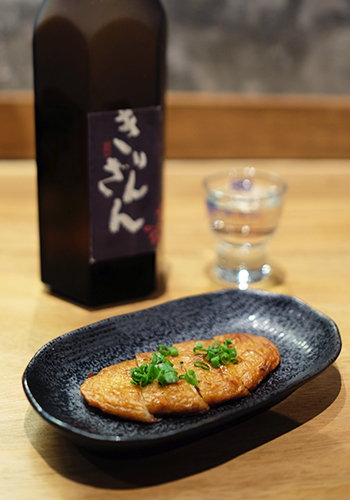 a. Japanese fish cake with grated ginger – The saltiness of the fish cake induced a burst of flavour from the sake when drunk after it. The food elevated the sake and makes it fuller in body but also enhances the after taste of the grated ginger. b. 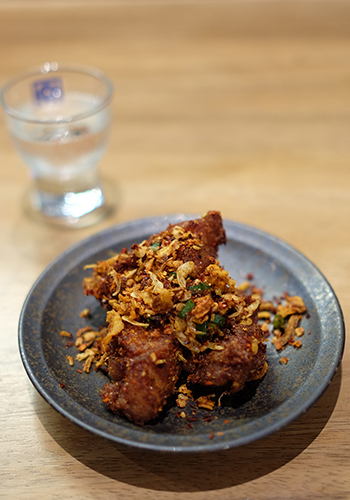 Deep fried chicken shaken with spices – The stronger flavour of the spices has a smoothing effect on the sake, giving it a softer mouthfeel and enhances the sweetness of the sake. 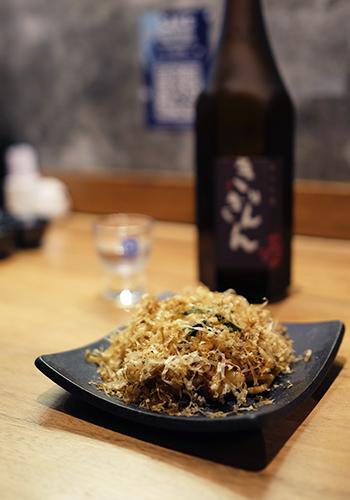 c. Japanese fried soba with bonito flakes – The soba has a soft texture that blends well with the medium bodied sake. The flakes and its saltiness compliment the Junmai Ginjo, allowing the sake’s fragrance to take charge and create a rounded flavour in the palate. Kirinzan Dento Karakuchi has a polishing ratio of 65%. This sake is slightly dry which helps cut through fatty food. A sake with less polishing ratio like this one can be drunk warm or cold as it has a fuller body and texture, is more flavourful and can taste more complex when warmed up to enhance its savouriness. a. Chicken white meat with cheese and sesame – The sake cuts through the cheese, letting the sesame taste come through more prominently and ends with the juiciness of the chicken. 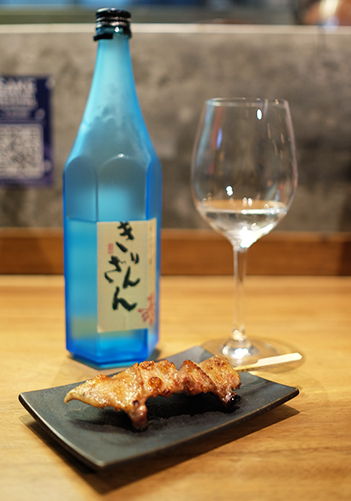 A workable pairing that balances out both the sake and the food, allowing more consumption. Sake Fest Malaysia 2018 will be held at The Gasket Alley on the 13th October 2018. Tickets are at RM100 each. To buy, go here. For the Facebook event page, go here. Watch KL light up from your front row seat at any of these bars and restaurants.